There are hundreds of sauces, including spaghetti sauce, barbecue sauce and Alfredo sauce, that will add flavor to your dishes. Unfortunately, the stains caused by the sauces will not look as good as they taste. However, if you have dripped sauce onto a pair of canvas sneakers or leather loafers, don't despair. The sauce stains can be removed with products found in your bathroom and pantry, so you don't need to toss the soiled shoes into the trash or waste money on a professional cleaning. Wipe away any excess sauce with a paper towel. Use a light hand when wiping the sauce away to prevent working any more sauce into the fabric. Dampen a cloth with water and cover a corner with liquid laundry soap. Blot at the stain with the liquid laundry soap. Start at the outside edge of the affected area and work your way toward the center to avoid spreading the stain. Continue to dab at the stain until it is almost completely removed. If the majority of the stain is removed, throw the canvas shoes into the washer and launder according to the label directions. 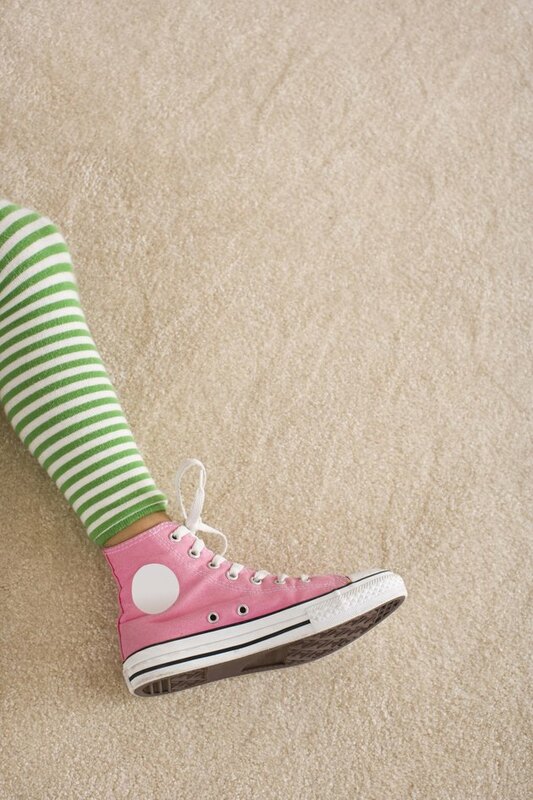 If the stain is not removed or the shoes are not machine washable, move onto the next step. Create a mixture of 1 gallon water and 2 tbsp. oxygen bleach. Oxygen bleach is available in powder form and will not whiten your colored sneakers. Soak the canvas shoes in the oxygen bleach solution for 10 minutes. Remove the shoes and scrub the affected area with a toothbrush. Rinse the shoes with cool water and set them onto a towel to air dry. Stuff the shoes with balled newspaper to help the shoes retain their form. Wet a soft cloth with white vinegar. Dab at the stained area with white vinegar until the stain is completely removed. Wet a soft cloth with plain water and wipe down the affected area to remove any residue. Work a dime-sized amount of leather conditioner into the cleaned area. Rub the conditioner into the leather using overlapping circles. Allow the conditioner to remain for 10 minutes before buffing the leather with a dry cloth.